The Burger Busters and the Mystery of the Empty Restaurant. Happy Meal and I had a hankering for some seared beef. This time we decided to sample the burgers at Patrick's Roadhouse in Santa Monica, CA. It was right on the Pacific Coast Highway on the way to Malibu. The Marinater had been suggesting that we try this place for a couple of weeks in a row, since it kept coming up on his Groupon radar. Happy Meal and I swung by the giant crater where The Marinater was doing a sledge hammer workout and beckoned him to join us with the promise of a hot meal. The Marinater obliged. We found parking behind the restaurant, and once we had parked, a valet attendant popped over to inform us that we had to pay for the "service" in spite of the fact that we had parked ourselves, and there was no signage--we looked. $5.50 down the crapper right there...annoying. We walked into a dead empty restaurant and bar. We were the only patrons at 7:00 pm on a Friday night. It was no wonder that Patrick's Roadhouse was posting a Groupon. It was deeply irksome that we paid a valet to NOT park the car only to wind up in an empty restaurant where space was certainly not at a premium. We were seated immediately. We ordered up a trio of burgers including the Dijon Plum Burger, which was the favorite of our server. The speaker over our table was blaring while cutting in and out. Our server was oblivious to both the noise level and the fact that the equipment was malfunctioning. Since the restaurant was empty, and there was no staff to keep an eye on me, I climbed on a chair and shut that noise down. The Beef: Ooof. The ten dollar cheeseburgers at Patrick's Roadhouse were mediocre at best. The patties weighed in at about 1/3 of a pound. The beef was bland Chuck. Yes, it was fresh, never frozen, 100% angus beef, but it was ten buck Chuck. 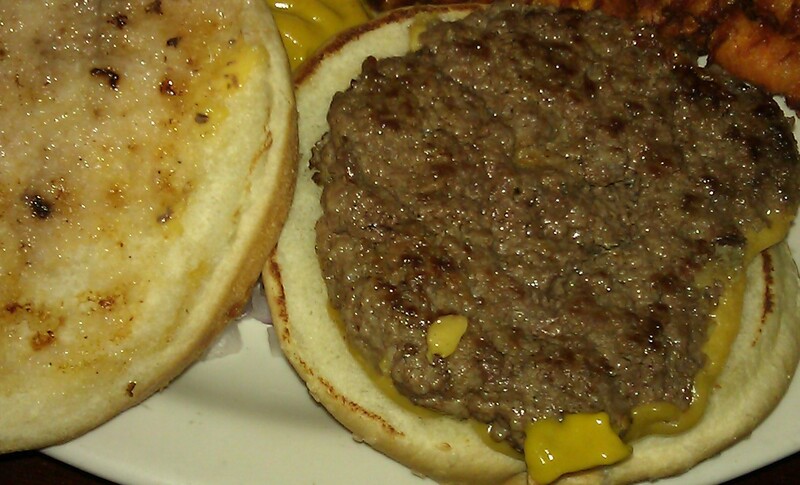 The patties were moderately beefy. There was a very faint hint of aging. And............no, that was it...nothing going on with the beef of any interest. The fat content was about 20%. The beef was not dry or chewy. It just simply completely forgettable. The Seasoning: There was a weak hint of salt on the exterior of the burger patties at Patrick's Roadhouse. The Sear: Yawn....there was a faint and sort of spotty, grayish sear on the small, flat Chuck discs. The Preparation: The burgers at Patrick's Roadhouse were cooked to Medium. The grind was also medium. This barely brought out the beefiness from the bland Chuck. The uniform burger patties were formed daily during shift prep. The Cheese: We had the choice of American, Swiss, Cheddar, and Mozzarella. We went with American on our burgers. Even the creamy, umami-rich, savory American cheese was not enough to make these burgers interesting. The Bun: The large buns were of the seeded, meagerly toasted, standard burger bun ilk. The buns were faintly yeasty and moderately sweet. The buns were relatively fresh--mostly the buns were too darn big for the wee burger patties. The Meat To Bun Ratio: WAY TOO MUCH BUN. The Toppings: For some odd reason Patrick's Roadhouse served both sweet dill pickle chips and sweet relish with their burgers. The Iceberg lettuce was fresh, and the tomato slices were fine. 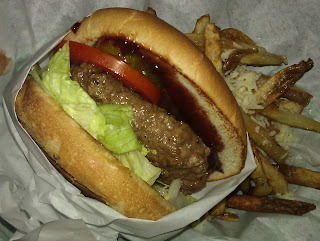 For an extra buck, we tried a cheeseburger with Dijon mustard and Plum Jam. It was fine...this combination tasted like a richer version of ketchup. The Fries: The peel-on, potato fries were cut in-house. Sadly, these fries were on the lank side. The were undercooked. The Sweet Potato fries were delivered on a truck, and they were of the crinkle-cut variety. These fries arrives slightly burned. The Truffle Fries came with a wad of grated cheese. The Truffle Fries were lank and somewhat greasier than their non-truffled counterparts. $2.50 for regular fries. $3.00 for Sweet Potato. $5.00 for Truffle Fries with Parmesan. The up charge for these low-quality fries on top of the over-priced burgers was just another fiscal eff you courtesy of the diner-free Patrick's Roadhouse. The Value: A mockery, an insult, a violation--just plain bad. The cheeseburgers at Patrick's Roadhouse were $9.95, and the Dijon Plum Burger was $10.95. Fries were extra. Even with the 10 for 20 Groupon, we were still out $22.20 (plus 10...plus tip....plus parking) on this over-priced shizz show. If we had paid the full boat of 47.70 bucks for that festival of blandness, my head would have exploded from indignation. We quickly solved the mystery of the empty restaurant. Patrick's Roadhouse was haunted with price gouging mediocrity in a neighborhood blessed with amazing views and FAR BETTER food. Oh...Arnold Schwarzenegger has a table there with a giant metal chair. Burger Review : This was expensive weakness on an over-sized bun. Patrick's Roadhouse had done an effective job of customer-proofing itself. Defending doesn't help your cause....offering a remedy in a public forum is far better. Not responding is a solid move, too. You simply failed to address the fact that the food was bland. We have been serving fantastic burgers for 39 years. That speaks for itself. We thank you for your patronage. Now I understand. Your promoting your own blog site. Best of luck! 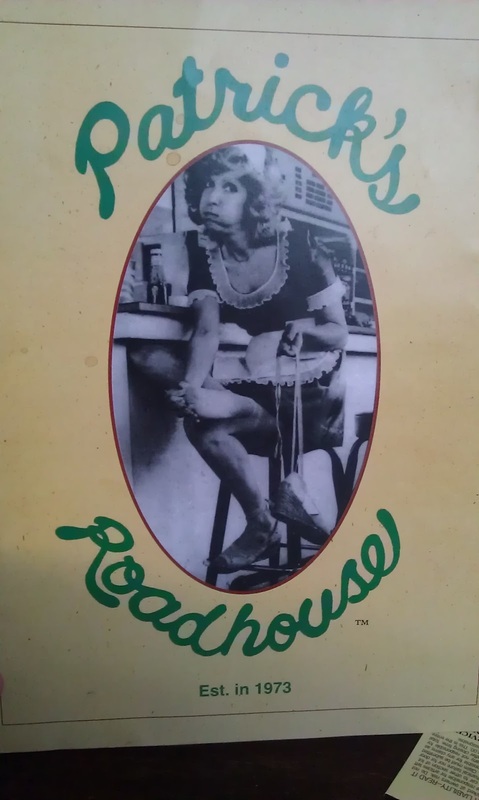 With that spicy attitude toward your customers, I think it is Patrick's Roadhouse that is need of some luck. Again, I do find it baffling that you chose to argue with an unhappy customer rather than seek a way to make things right. You are certainly doing your part to keep that dining room empty. If that is your goal, then I commend you on your fine and directed efforts. hahaha I love their responses! Good restaurants will never argue with a review. Instead, they either keep quiet and improve, or they apologize and say how they will improve. Guess we know where Patrick's Roadhouse stands. Thanks for the chuckles, Pete. Anthony kept going after that. I was flabbergasted at his need to be defensive. Weirdly, he was still at it during the "packed" lunch hour. Either "packed" does not mean what he thinks it means, or he is a lousy manager that would rather bicker on Yelp over running his restaurant. Either way...oof. At the risk of piling on where no further piling on is needed, those fries look like the maggot spawn of Mothra. I do hope they didn't taste as horrifying as they look. Piling on is encouraged. The fries, were over-priced. The sweet potato fries were on the burnt side, so....weak. The truffle fries were lank and greasy with a clot of cold, shredded parm sort of plopped in the center. It was a shizz show, my man. I recently saw "Patrick's Roadhouse" on a 2007 rerun of Guy Fieri's "Diner's, Drive-ins and Dives". The burger patty looked unappetizing. 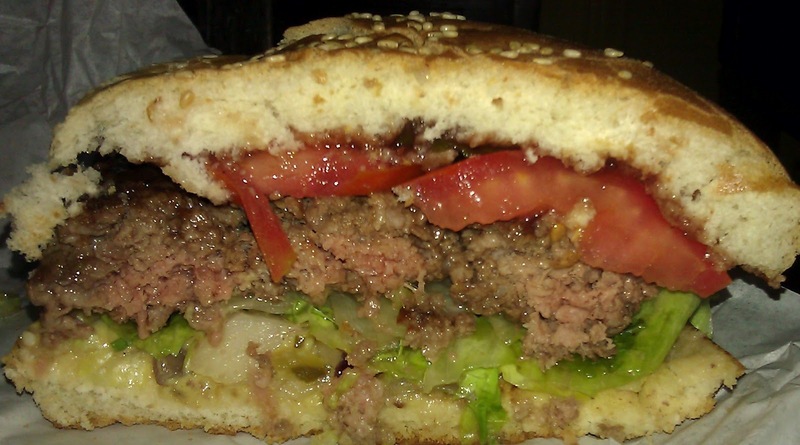 When you see burger patties on TV it usually makes your mouth water. Not this time. I'm wary of restaurants in prime locations, since the "guaranteed" customer flow allows them coast on location alone.